David Sharpe launching the program. Photo: Supplied by ASADA. Australia’s anti-doping agency, ASADA, is enlisting parents in its latest strategy to educate the next generation about the dangers of performance-enhancing drugs. The agency believes parents play a crucial role in the battle against doping and has designed the Parents’ Guide to Support Clean Sport, an online anti-doping course to help parents educate their children on how to protect themselves. 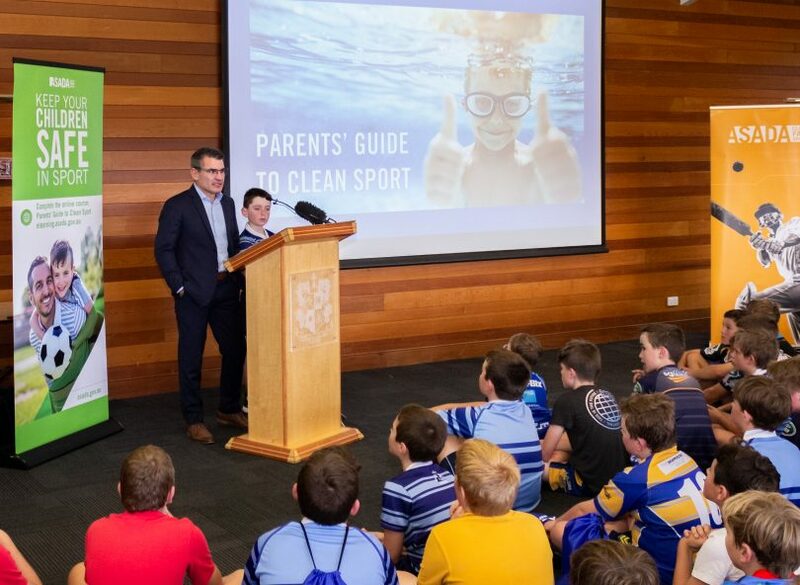 ASADA CEO David Sharpe said the pressure to train hard, compete and achieve at the highest level can lead young athletes to “think about taking dangerous shortcuts”, which is why the agency has developed a parents’ guide to support clean sport. Mr Sharpe said many parents around the world are unaware of how prevalent doping is and how easy it is to buy banned substances. “The course is designed to help parents enhance their children’s knowledge of how to protect themselves in their sport or career,” Mr Sharpe said. “I know many parents around the country and around the world see doping as steroids and part of the program we are delivering is to tell you that is not the case. Mr Sharp said that 45 per cent of 14 to 16-year-old boys have had protein shakes and one in five supplements sold in shopping centres contain banned substances. He hopes the course will make anti-doping a part of sports culture at a grassroots level. In partnership with the World Anti-Doping Agency (WADA), ASADA launched the program globally at Marist College on Wednesday afternoon (3 April). 1996 Olympic Rowing gold medalist and mother of two Megan Marcks was at the launch and said there are myths surrounding elite sport that need to be broken. “I really want my kids to have a really positive experience with their sport and having a resource like this where you can start to get information about what are some of those important conversations you need to be having with children,” she shared. “There are more supplements that are readily available and there is a bit of a myth and misconception that all elite athletes actually do take supplements but that is not the case. The course is hosted on both ASADA’s eLearning platform and on Play by the Rules, to ensure it reaches as many Australian parents as possible.